Earnest C. Brooks Correctional Facility is located in Muskegon Heights Michigan. It has level I, II, and IV inmates and has a capacity of 1,246 adult males. This prison consists of three level II housing units that hold 240 inmates each, two level IV units that hold 384 inmates, and a single level I unit that holds 120 offenders. Inmates are divided into their security levels and do not integrate within the facility. 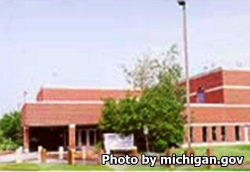 The Michigan prison industries operates a notebook bindery and laundry work details. Offenders can also earn a GED and adult basic education while incarcerated. Vocational courses are offered in food preparation and services as well as electronics repair.